CAN ONE TAXI DRIVER CORNER THEM BOTH? The Washington Post writes, "Nobody’s Angel is a gem...it’s just about perfect." Chicago Sun-Times on NOBODY’S ANGEL: "Heartbreaking...captivating... each page turn feels like real, authentic Chicago." 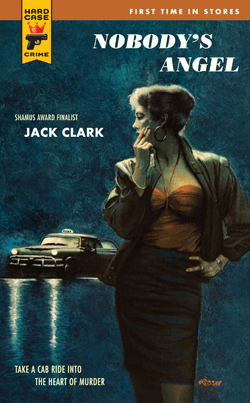 Booklist on NOBODY’S ANGEL: "The cynical, melancholy cabbie point of view is perfect for this kind of neon-lit, noir-tinged, saxophone-scored prose poem, and Clark hits all the right notes." Publishers Weekly on NOBODY’S ANGEL: "[A] slim, sparse, and heartbreaking novel." "A brisk style and fine descriptions...a great read." "A pure delight...the best mystery of the month...There’s a memorable moment...on virtually every page."